Who uses NASA Earth science data? Dr. Karen Seto, to study the environmental effects of urbanization. 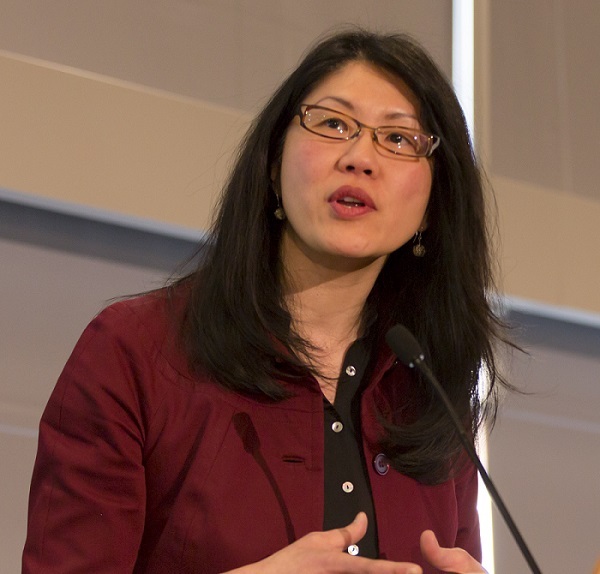 Image of Dr. Karen Seto courtesy of Yale University. Research interests: Urbanization and its effects on local and global environments, with a particular research emphasis on India and China. Research highlights: In 1950, the population of India was slightly less than 400 million people. Today, India’s population is more than 1.3 billion people, according to figures from the United Nations. The growth and spread of the Indian population can be tracked not only formally through India’s national census, but also informally by instruments aboard orbiting Earth observing satellites. For example, a comparison of 2012 and 2016 nighttime lights imagery created from data collected by the Visible Infrared Imaging Radiometer Suite (VIIRS) aboard the joint NASA/NOAA Suomi National Polar-orbiting Partnership (Suomi-NPP) satellite shows a dramatic increase in anthropogenic, or human-created, lights along the northern border of India, indicating continued population growth in an area that has some of the country’s highest population densities. The combination of field and remotely-sensed data provides a more complete picture of the effects of urbanization on biodiversity, croplands, and energy use. NASA Black Marble nighttime lights imagery of India from 2012 (left) and 2016 (right) created from Suomi-NPP/VIIRS data via NASA’s Earth Observatory and displayed using the EOSDIS Worldview application. Notice the dramatic increase in lit areas in the 2016 image, especially along the northern border of India. Explore these images using Worldview (left image: go.nasa.gov/2qX0SKS; right image: go.nasa.gov/2rVfO9v). Images courtesy of Worldview. Dr. Karen Seto’s research into how urbanization is changing our planet relies on this combination of field and remotely-sensed data. Her research has shown that over the last 30 years urbanization has taken place on some of Earth’s most fragile lands, making cities and other clusters of human population more vulnerable to the impacts of climate change. In addition, she has found that urbanization significantly affects biodiversity in areas of high conservation value. High conservation value, or HCV, areas are those with biological, ecological, social or cultural value of outstanding significance or critical importance, according to the HCV Resource Network. Dr. Seto coordinates much of her work and research through the Seto Lab at Yale University. Dr. Seto and the students, postdoctoral researchers, and staff in her lab explore the linkages between urbanization, global change, and sustainability, with a specific focus on India and China—two countries undergoing the largest urban transitions in the world. As noted on the lab’s website, global satellite imagery provides unique insight into urban land-use change and its economic and environmental effects at a global scale. In a recent study, Dr. Seto and Bhartendu Pandey, a Ph.D. student in the Seto Lab, used satellite data and imagery of India along with Indian census data to examine the impacts of urbanization on the loss of agricultural land, which also is called the “urban conversion of agricultural land” or UCAL. The research team used satellite data to assess agricultural land loss and compared these satellite-derived estimates with Indian agricultural census data. An analysis of Moderate Resolution Imaging Spectroradiometer (MODIS) vegetation imagery along with nighttime lights data were used to construct land-cover change histories. Results of the research indicate that UCAL in India is greater in Indian states where urbanization and economic growth are high, with agricultural land loss concentrated around smaller cities more than larger cities. The data also show that the total area under UCAL in India between 2001 and 2010 has been increasing since 2006, but is still relatively low. The use of remotely-sensed nighttime lights imagery is a powerful tool for tracking urbanization. Dr. Seto was part of a team that used nighttime lights imagery from the Defense Meteorological Satellite Program/Operational Linescan System (DMSP/OLS) combined with 10 years of vegetation datasets from the European Satellites Pour l’Observation de la Terre (SPOT) program to map Indian urban areas at the national scale. This research also utilized data from the Global Rural-Urban Mapping Project , Version 1 (GRUMPv1), which is available through the Socioeconomic Data and Applications Center (SEDAC), to help identify urban areas. This was the first investigation of urban growth in India using nighttime lights imagery. The results showed that DMSP/OLS nighttime lights imagery, if intercalibrated to enable a series of images over time to be compared at similar scales, can be an effective tool for examining changes and growth in urban areas. While the DMSP/OLS nighttime lights imagery offer a unique archive spanning over 20 years, the data are collected using different satellites. Dr. Seto and her team are working on methods to improve the comparability of the time series from these data. Nighttime lights imagery also can be used to monitor short-term changes in urban areas, such as power failures caused by hurricanes or changes in human activity related to other events. Another of Dr. Seto’s Ph.D. students, Eleanor "Kellie" Stokes (a NASA Harriett Jenkins Fellow) is developing techniques to use VIIRS nighttime lights signals to identify temporary changes (such as blackouts from power failures), seasonal changes (like holiday lights), and other long-term changes (including urbanization or changes in electrification rates). VIIRS Day/Night Band (DNB) imagery is available as a base layer in the Earth Observing System Data and Information System (EOSDIS) Worldview data visualization application. Finally, Dr. Seto and her colleagues combined DMSP/OLS nighttime lights imagery with data from NASA’s SeaWinds microwave scatterometer aboard the Quick Scatterometer satellite (QuikSCAT) Earth satellite (operational from 1999 to 2009) to examine changes in built-up infrastructure (e.g., buildings and other construction) in global urbanized areas. These urban landscapes, characterized by large areas of impervious surfaces, contribute significantly to local and regional changes in climate (such as the creation of areas of elevated temperature called urban heat islands), hydrology, biodiversity, land use (agricultural vs. forested land), and biogeochemical cycles (such as the effects of atmospheric pollutants leading to the creation of smog and acid rain). While the primary purpose of the SeaWinds scatterometer was to study surface ocean wind vectors and the instrument was not intended for use over terrestrial areas, analysis of SeaWinds data indicated that this instrument could detect reflected radiation (also called backscatter) from major urban areas. Construction in urban areas leads to numerous surfaces that backscatter radiation, which can be detected by microwave sensors like scatterometers. Dr. Seto and her colleagues explored whether this remotely-sensed backscatter can be used to analyze changes in urban areas over time. After analyzing nighttime lights and microwave backscatter data for 100 large cities on six continents, the research team found that these measurements provide a means of evaluating the physical dimensions of urban change (such as increases in building size and volume) over time in large cities. As caveats, the team notes that sensor saturation limits the utility of nighttime lights data for studying core areas of large cities and the coarse resolution of SeaWinds data makes this sensor unable to detect small cities or resolve spatial details of structural change in large cities. Dr. Seto recently received NASA funding for a project that will use multi-scale and multisource satellite data to examine urban growth in the Hindu Kush Himalayan (HKH) region. This region extends across eight countries (from Afghanistan in the west to Myanmar in the east) and is home to about 210 million people. The primary goals of this research are to characterize and quantify land cover and land use change associated with urban settlement change in the HKH and assess the vulnerability of urban settlements in this region to hazards. As Dr. Seto notes on the Seto Lab website, we are now in the urban century, with unprecedented growth in urban areas. The availability of more than 40 years of Earth observing satellite data gives scientists studying the effects of urbanization an unprecedented global view of this growth and the effects of these changes on our planet. Zhang, Q., Pandey, B. & Seto K.C. (2016). “A Robust Method to Generate a Consistent Time Series from DMSP/OLS Nighttime Light Data.” IEEE Transactions on Geoscience and Remote Sensing, 54(10): 5821-5831 [http://doi.org/10.1109/TGRS.2016.2572724]. Román, M.O. & Stokes, E.C. (2015). “Holidays in lights: Tracking cultural patterns in demand for energy services.” Earth’s Future, 3(6): 182-205 [http://doi.org/10.1002/2014EF000285]. Pandey, B. & Seto, K.C. (2015). “Urbanization and agricultural land loss in India: Comparing satellite estimates with census data.” Journal of Environmental Management, 148(15 January 2015): 53-66 [http://doi.org/10.1016/j.jenvman.2014.05.014]. Frolking, S., Milliman, T., Seto, K.C. & Friedl, M.A. (2013). “A global fingerprint of macro-scale changes in urban structure from 1999 to 2009.” Environmental Research Letters, 8(2) [http://doi.org/10.1088/1748-9326/8/2/024004]. Pandey, B., Joshi, P.K. & Seto, K.C. (2013). “Monitoring urbanization dynamics in India using DMSP/OLS night time lights and SPOT-VGT data.” International Journal of Applied Earth Observation and Geoinformation, 23(August 2013): 49-61 [http://doi.org/10.1016/j.jag.2012.11.005].